There were many times, when everything seemed to fall apart, myself included. When I felt stuck, trapped, scared to death and there was no right choice. Only choices that led to even more suffering. Staying in this place was too hard to bare. Choosing anything only led to self-loathing, guilt and craving for the un-chosen. Spiralling down. And then, in the midsts of it all, this came to me through a dear friend. 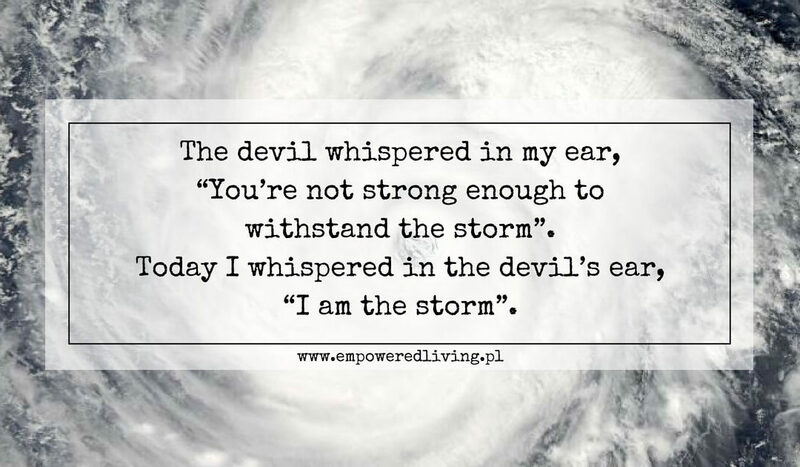 Today I recognize, that I AM THE STORM. The creator of all the beauty and all the suffering I experience. I cannot escape pain. And I do not need to add suffering of thoughts, of stories, of blame, of guilt to it. I can fall into the possibility of being the storm itself. Open up to it, surrender to it, become one. Stay present. Be in the NOW and allow what is happening right there, also my resistance if this is what it is. And let it take me where I need to go, to become my highest possibility.